When I think of this cake, the famous Торт “Птичье Mолоко”, literally translated as “Bird’s Milk” Cake, there are a few words that come to mind – indulgent, holidays, the embodiment of perfection, and above all – delicious. It’s a chocolate covered Vanilla Soufflé Cake. 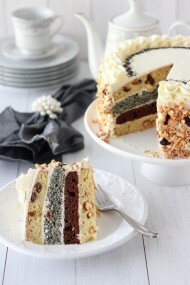 Tea or coffee are a must and good company is even more crucial to go alongside this cake. I have no idea how it earned such a funny title, but its fame spread far and wide, because of how good it was and still is. William Shakespeare once wisely said that “a rose by any other name would smell as sweet,” so that is all that matters to me. My parents tell me stories of the old country (Belarus, at that time known as the USSR), with long lines outside of grocery stores, people willing to stand for hours hoping that they would be able to buy this cake, especially for a holiday or a birthday party. Apparently it was a favorite with many people, since it would very quickly be sold out and all those hours in lined utterly useless and the disappointment even more bitter. These were the years of deficit, scarcity and rationing. The souffle part of this cake is like nothing I’ve ever tried before. It’s so creamy, fluffy and with a cloud-like texture. As you take a bite, it starts to melt in your mouth. It’s velvety and luxurious. The cake itself is also tender, soaked in a chocolate liqueur syrup (my contribution) and it’s all covered in a chocolate ganache. It’s surprisingly doable, and worth every ounce of effort. I’ve tried so many different recipes throughout the years, and have finally tweaked, made changes, and subjected my husband to many taste testing segments, to come up with this variation. I’m sure my husband didn’t mind being a taste tester and I’m so happy to finally be able to document the recipe and not only share with all of you, but be able to pass it on to our family and future generations. 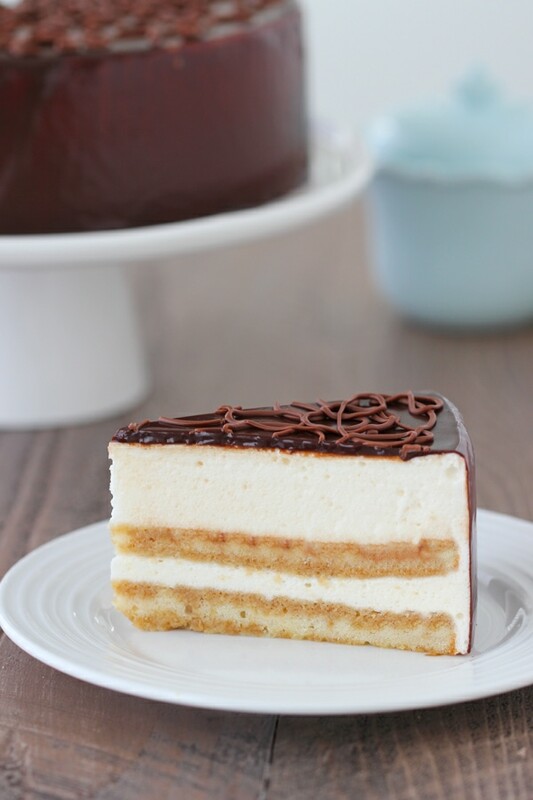 Since we no longer live in Belarus, it’s even more important to make this cake from scratch, because we can’t walk over to a local grocery store, with fingers crossed that they still have one of these beauties in stock. I bet you that if you can follow directions and have just a bit of baking experience, you can definitely expect to be very proud of yourself when you bring this to a holiday table. Preheat the oven to 350 degrees Fahrenheit. 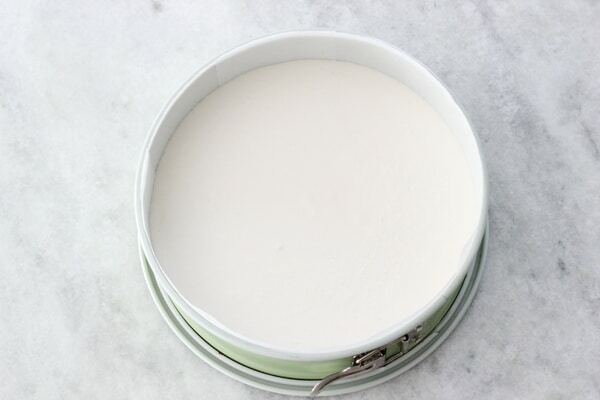 Line the bottom of a 9 inch round cake pan with parchment paper and spray the bottom and the sides of the pan with oil. 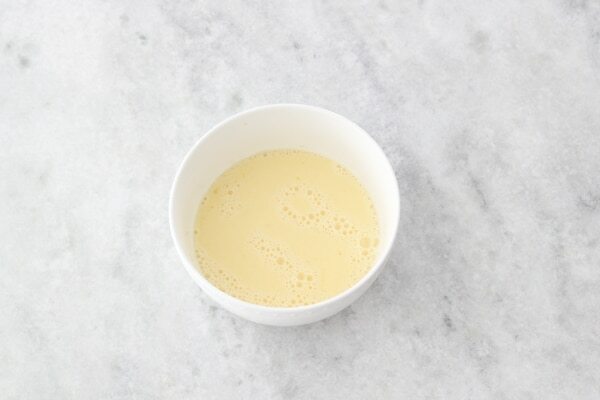 In a medium bowl, combine the milk, eggs and vanilla extract, whisking with a fork (or whisk) until evenly combined. Set aside. In a large bowl, mix the flour, sugar, baking powder and salt. If you don’t have cake flour, you can make a substitute very easily. 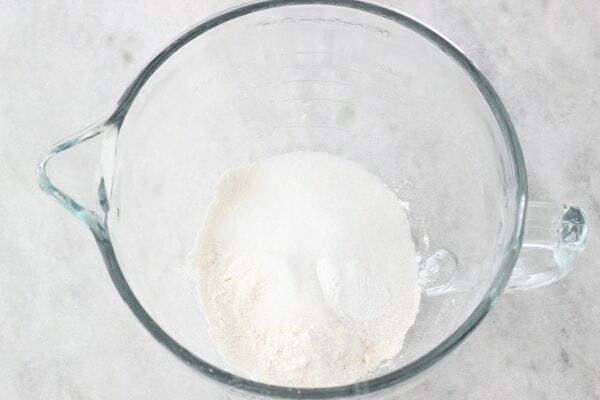 Measure out 1 cup of flour, remove 2 Tablespoons of the flour, and return the flour to your flour canister and then add 2 Tablespoons of cornstarch to the flour. Sift the flour and the cornstarch together several times. (Of course, you still need 3/4 cup plus 2 Tablespoons of cake flour for the recipe, not the full cup.) 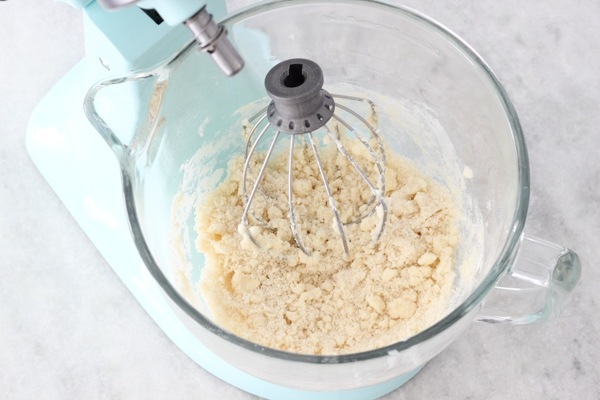 Using a standing mixer, or a hand mixer, turn it to low speed and add the butter to the flour mixture, one piece at a time, just until you get coarse crumbs, you definitely don’t want to mix it too much. Pour in half of the milk mixture and mix on medium speed until the light and fluffy, about 1 minute. 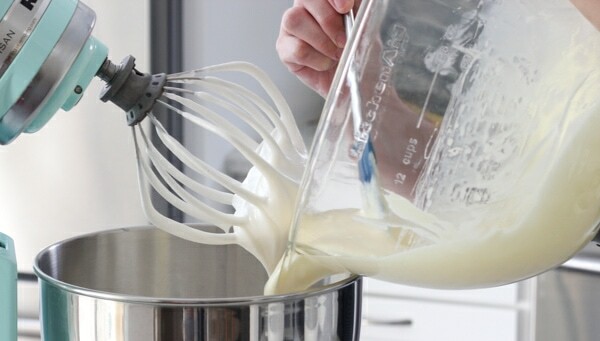 Add the rest of the milk mixture and mix just until combined. Don’t over mix it, or the cake will not be as tender and fluffy. 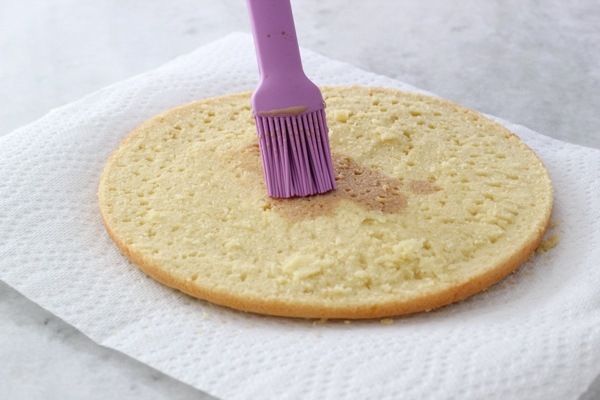 Use a rubber spatula to make sure there isn’t any unmixed batter on the sides or bottom of the bowl. Pour the cake batter into the prepared cake pan. Bake in the preheated oven for 20-25 minutes, until a toothpick inserted into the center of the cake comes out clean. Let the cake cool in the cake pan for about 5 minutes and then take it out and let it cool completely on a wire rack. When the cake is completely cool, cut it in half horizontally. I really like using syrups in cakes because it helps to keep them moist and tender. 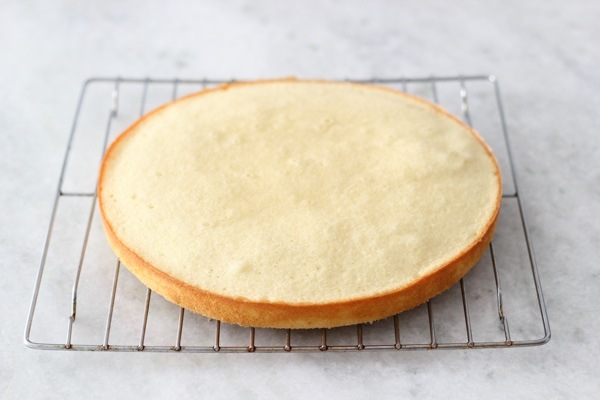 Since in this cake we are not using any frosting, I think it’s pretty important to use a syrup to soak into the cake layers, which will not only keep the cake layers from drying out, but will add additional flavor to the cake. Use a 9 inch springform pan to assemble the cake. 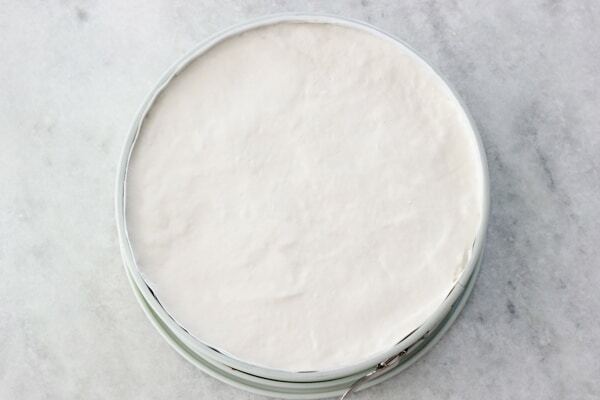 Line the edges of the springform pan with parchment paper. A regular 9 inch round cake pan is just a tad bit smaller than a 9 inch round springform pan, which is perfect, since the cake layers will be slightly smaller than the springform pan, allowing the soufflé to settle around the cake layers and will create a really smooth surface for the sides of the cake. Quick disclaimer: For this cake, raw egg whites are used. If you make sure to buy fresh eggs and keep them refrigerated at all times, you should be ok, but of course, there are always risks when consuming raw eggs. I’ve been making this type of soufflé and other meringue type frostings for many years and we have never gotten sick. If you are worried about that, then I’m really sorry, but you will have to find another recipe for this cake. You can try using pasteurized egg whites, or other substitutes, but since I have never personally used them, I can’t tell you how they will work in this recipe. If you want to avoid eggs for the soufflé, you can make a soufflé with just cream and gelatin, etc., but the texture will be completely different. 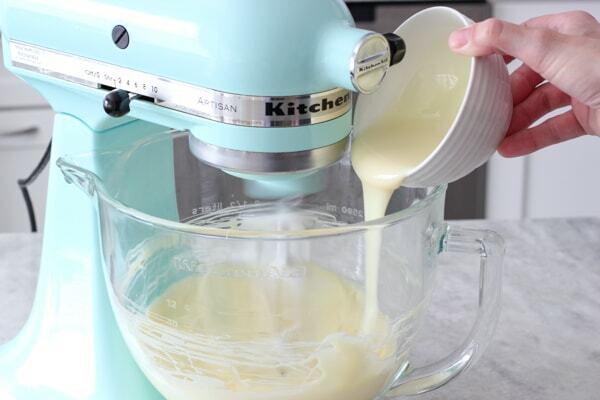 In a large bowl, using a paddle attachment of a standing mixer or using a hand mixer, mix the butter until it’s light and fluffy. Pour in the sweetened condensed milk and mix until evenly combined. Set it aside at room temperature. Add the bloomed gelatin mixture to a small heavy bottomed saucepan along with 1/2 cup of sugar. 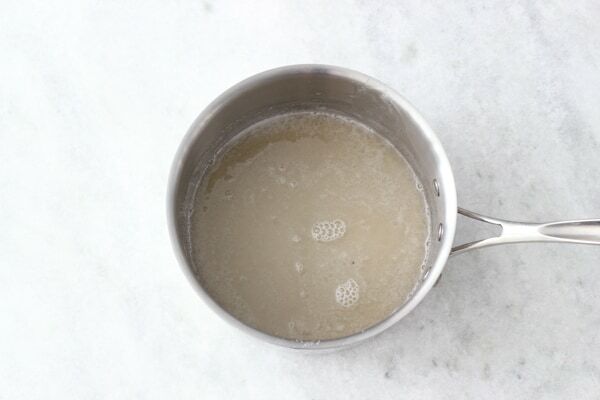 On low heat, cook the mixture just until the sugar and the gelatin dissolve, but don’t boil it. Set it aside to cool slightly. 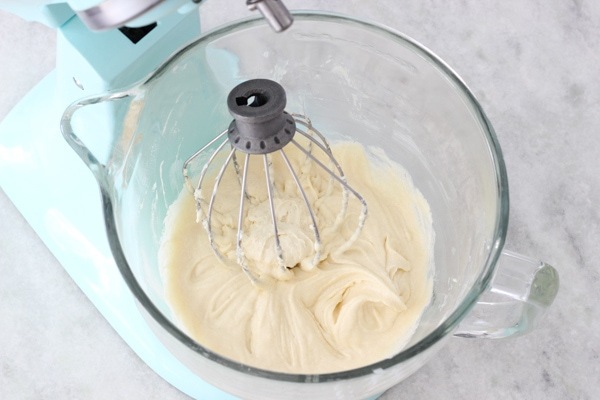 Meanwhile, in the large bowl of a standing mixer, using a whisk attachment, whisk the egg whites until frothy and then gradually pour in the remaining 1/2 cup sugar, then add the lemon juice and the vanilla extract. Place the first half of the cake on the bottom of the springform pan. Brush the top of the cake layer with the chocolate syrup. Immediately pour in half of the soufflé mixture over the cake layer and smooth it out, tapping the pan gently on the counter to help the souffle settle around the cake layer. 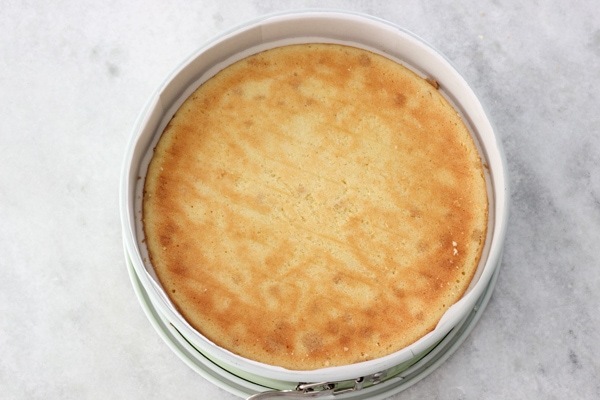 Brush the bottom of the second half of the cake layer and place it syrup side down on top of the soufflé layer. Brush more chocolate syrup over the top of the cake layer. You may have some syrup left over, or you may not:). Pour in the remaining half of the soufflé over the cake layer and smooth it out, once again tapping the cake pan gently on the counter to help it settle around the cake layers. Place the cake in the refrigerator to cool completely, at least 2 hours. I usually do this overnight. 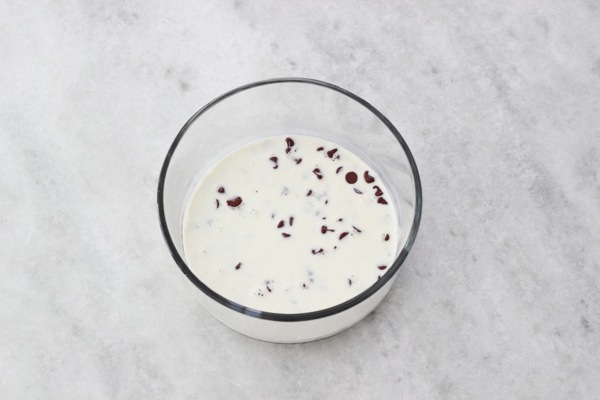 Place the chocolate (you can use chocolate chips, chocolate chunks or cut up a bar or chocolate into small pieces) into a medium bowl with the salt. Pour in the hot, simmering heavy cream over the chocolate, and let it stand for about 7-10 minutes. 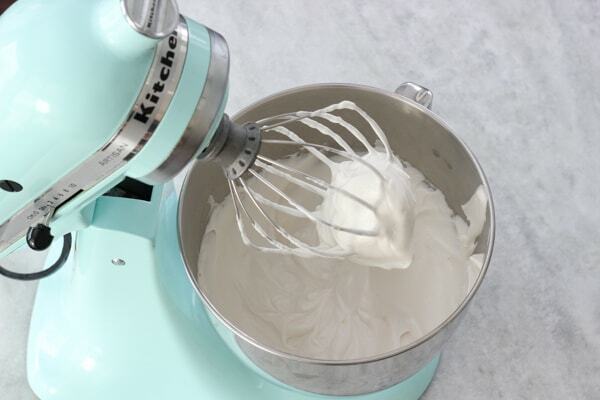 Use a whisk to mix it all together until smooth. 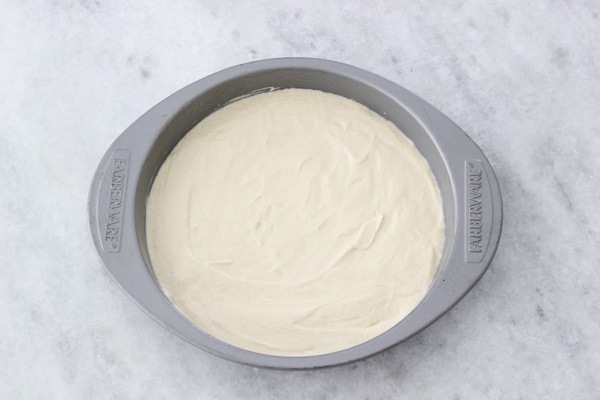 Take the cake out of the refrigerator and remove it from the springform pan. Place the cake on top of a rack and gently remove the parchment paper from the sides of the cake. Pour the chocolate ganache over the top of the cake. 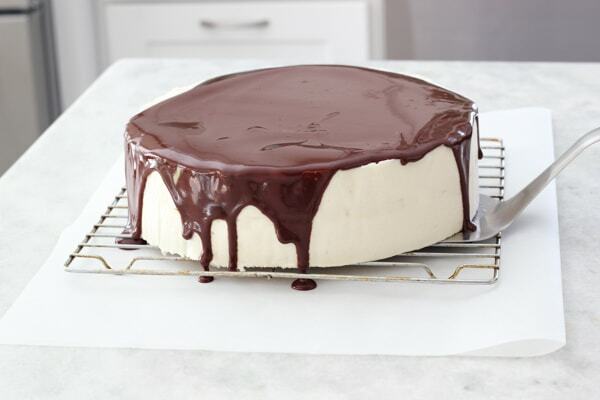 I like to pick it up and very careful swirl the cake so that the excess ganache run down over the sides of the cake, adding more ganache as necessary and then let it stand for about 5 minutes, just so that the excess chocolate drips off. I don’t have a good picture of this process, since I was making this cake alone and didn’t have anyone around to give me a hand with a picture. 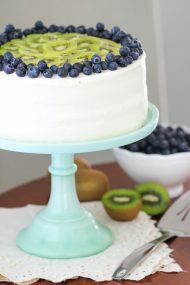 Transfer the cake to a serving plate or cake stand. Refrigerate until the chocolate ganache is set. You can decorate the cake as you wish. I melted some milk chocolate and piped swirls over the top of the cake, and the color of the milk chocolate is lighter than the semi sweet chocolate that I used for the ganache, making a color contrast. You can also decorate the cake with berries, nuts or chocolate shavings. Vanilla Souffle Cake - "Торт Птичье Mолоко"
In a large bowl, mix the flour, sugar, baking powder and salt. 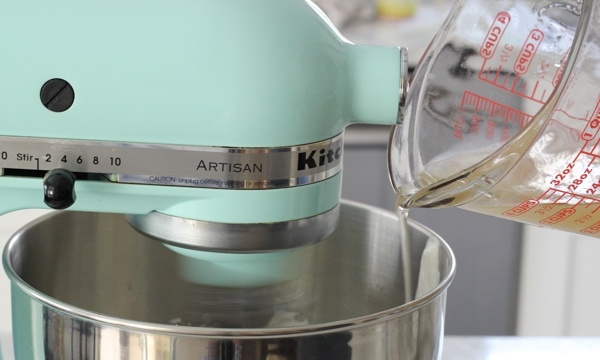 Using a standing mixer, or a hand mixer, turn it to low speed and add the butter to the flour mixture, one piece at a time, just until you get coarse crumbs, you definitely don't want to mix it too much. Pour in half of the milk mixture and mix on medium speed until the light and fluffy, about 1 minute. Add the rest of the milk mixture and mix just until combined. Don't over mix it, or the cake will not be as tender and fluffy. Use a rubber spatula to make sure there isn't any unmixed batter on the sides or bottom of the bowl. I really like using syrups in cakes because it helps to keep them moist and tender. 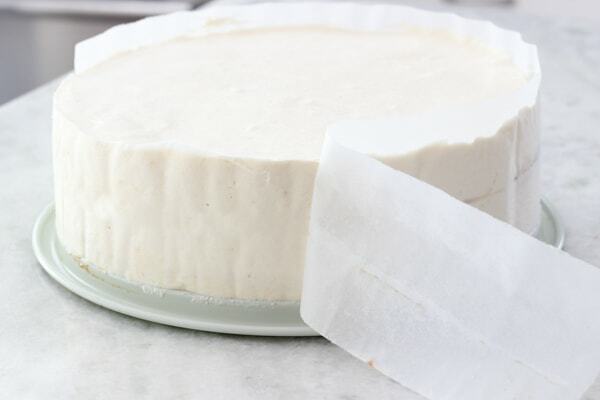 Since in this cake we are not using any frosting, I think it's pretty important to use a syrup to soak into the cake layers, which will not only keep the cake layers from drying out, but will add additional flavor to the cake. 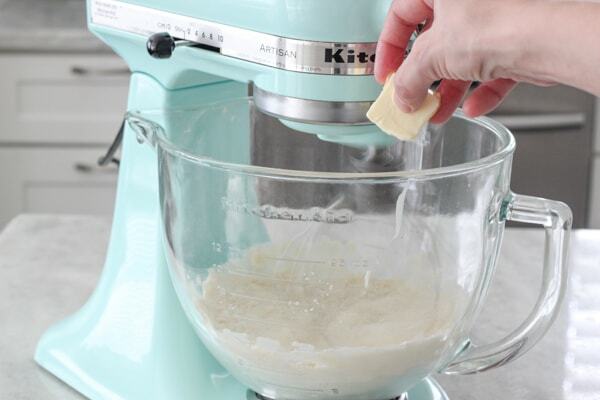 In a large bowl, using a paddle attachment of a standing mixer or using a hand mixer, mix the butter until it's light and fluffy. 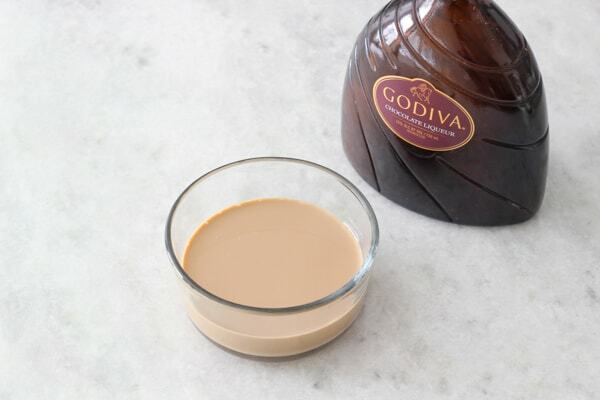 Pour in the sweetened condensed milk and mix until evenly combined. Set it aside at room temperature. 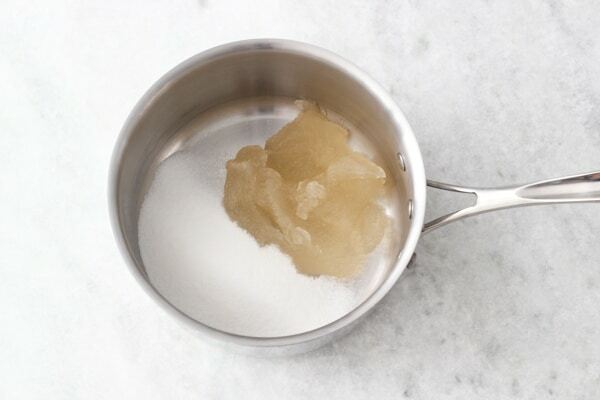 Add the bloomed gelatin mixture to a small heavy bottomed saucepan along with ½ cup of sugar. On low heat, cook the mixture just until the sugar and the gelatin dissolve, but don't boil it. Set it aside to cool slightly. Place the first half of the cake on the bottom of the springform pan. Brush the top of the cake layer with the chocolate syrup. Immediately pour in half of the soufflé mixture over the cake layer and smooth it out, tapping the pan gently on the counter to help the souffle settle around the cake layer. 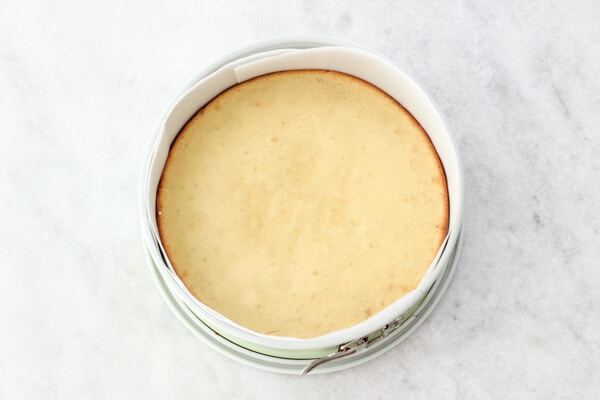 Brush the bottom of the second half of the cake layer and place it syrup side down on top of the soufflé layer. Brush more chocolate syrup over the top of the cake layer. You may have some syrup left over, or you may not:). Pour in the remaining half of the soufflé over the cake layer and smooth it out, once again tapping the cake pan gently on the counter to help it settle around the cake layers. 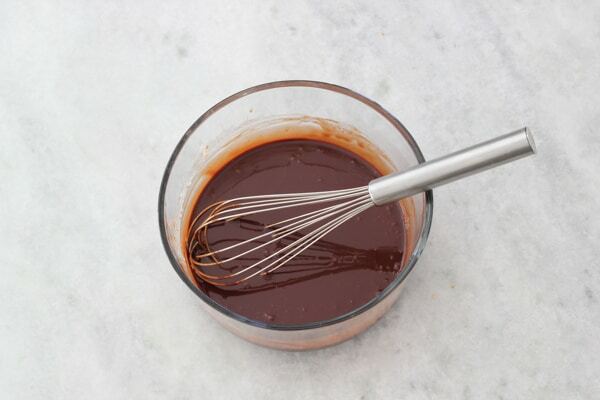 Pour the chocolate ganache over the top of the cake. I like to pick it up and very careful tilt the cake so that the excess ganache run down over the sides of the cake, adding more ganache as necessary and then let it stand for about 5 minutes, just so that the excess chocolate drips off. You’re welcome, Natalya. God bless you too. 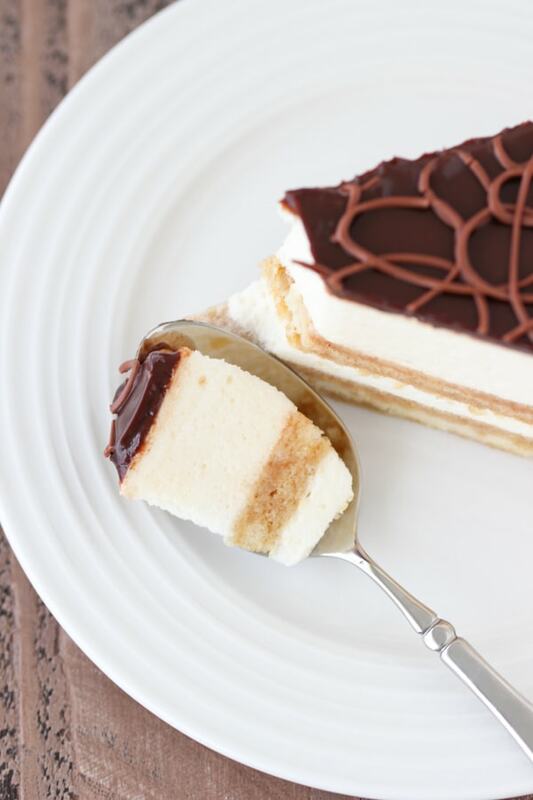 This is a magnificent dessert – completely worth the effort to make it! I am absolutely impressed how you can find time and energy to research, bake, and bake again, take photos, write the post, etc. I bow myself before you! I do! Have lovely Easter – I have copied your Mimosa salad which I think looks truly beautiful and the garlic knots to make. Maybe also the “Piece of cake” cake. Its going to be an “all in all Olga Easter”. Have a lovely time. I am off next week and return on Easter Monday to work. What a sweet comment, Barbara. Thank you so much for your kind words. 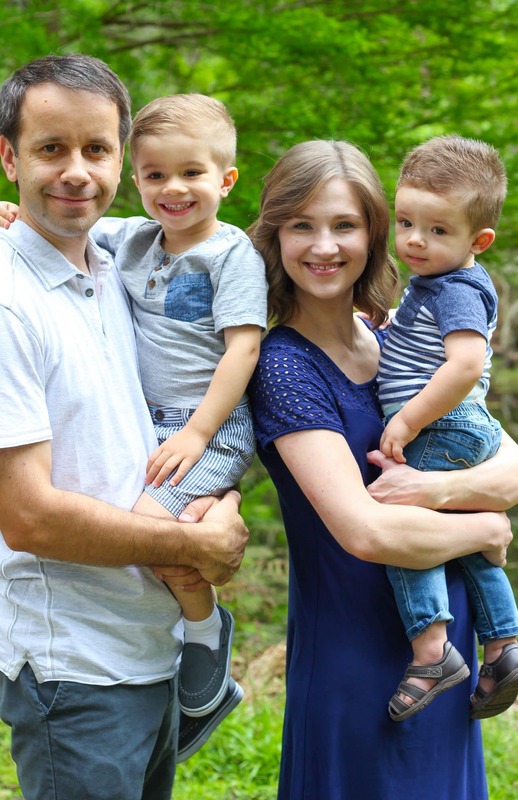 It’s hard to find time and energy, especially when I have a very active little boy who keeps me busy, but cooking and baking have always been something I enjoy. I have actually been thinking of putting Mimoza on my Easter menu too! It’s one of my favorite Russian salads. I am so honored that my recipes will be included in your Easter. Looks delicious! 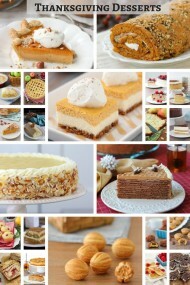 Bird’s milk desserts are my favorite, can’t wait to make it this weekend! Perfect cake for the start of the spring break. Thank you! I hope you enjoy it, Ira! 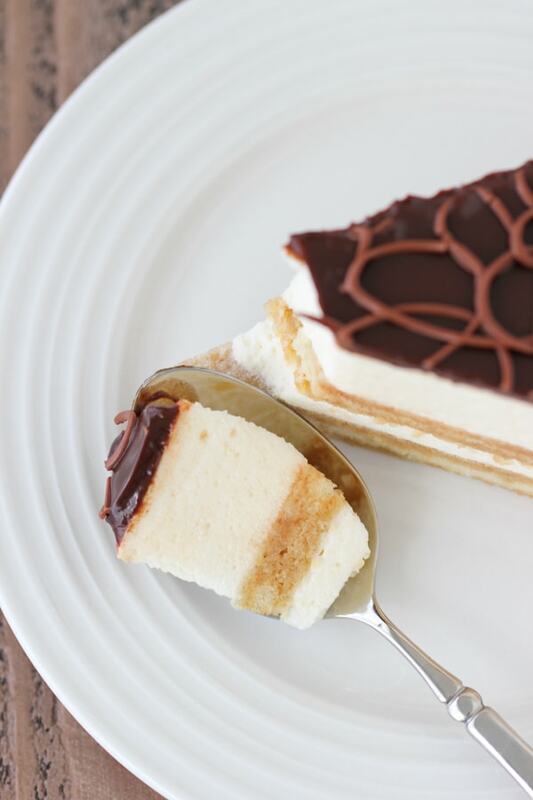 Bird’s Milk cake is always a hit whenever we have it and it seems like it’s a favorite for many people. What a beautiful cake! Looks so fancy. My husband loves anything birds milk so I’m excited to make this for his birthday. I learned to cook from your website, so most of his favorite food is from here. p.s. maybe the word “infamous” in the first sentence is a typo. Thank you, Natasha! My husband loves it too, so I’ve been trying to come up with the perfect recipe for years. 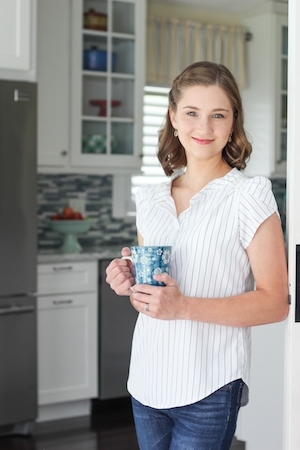 I’m so glad that you are enjoying the recipes on my blog; that really touches my heart. I fixed the typo. Thank you so much for pointing it out to me. What a great memory to have, Tzivia. I love food that has some nostalgia to it. Love all the detailed instructions! Thanks for sharing! Saving this for future reference! Thank you. I would love to know what you think once you make it. Hi Olga, I’m thinking to make this cake for our Bible Study group get together on Easter. My question is, do I need to keep the cake in the fridge all the time or is it okay to have the cake sit on the table for about 3-4 hrs while people eat it. Will the ptichiye moloko change its texture when its room temp? No, you don’t have to keep it in the refrigerator the whole time. As long as the cake has completely set, it should be ok, although I wouldn’t recommend leaving it at room temperature for more than a few hours. 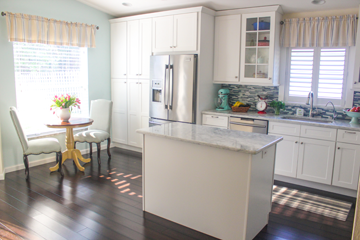 It usually doesn’t take too long for people to get cake, eat it and come back for seconds (if they want), so you could probably return it to the refrigerator much sooner, unless there won’t be a refrigerator available. I would say the same thing about most cakes, not just this one. The souffle part will not melt and change texture, it will just get warmer and softer. I’m so happy to hear that, Lana. Thank you for taking the time to write. hey olga this cake looks devine! im planning on making for easter and was wondering is there anything i can use to substitute the chocolate liquor maybe rum? Yes, you can use rum, Oksana. It does deflate a little bit when you add the buttercream to the whipped egg whites, but it who’ll still have a very smooth consistency, not grainy at all. I hope it works out for you, Lesya. Hi Olga, I trying to make this cake and I got to beating the whites for soufflé The consistency is not so stiff as if I were to beat the whites for a biskvit cake for instance but is a bit on the runny side…not too runy but it’s not super stiff either. Im not sure what consistency it should be. i used organic raw eggs but they were at room temperature so maybe that’s why it’s not coming out stiff? Can’t wait to try it. I wonder if opting for a coffee-flavored (I don’t have anything similar to a chocolate one) syrup would not take away from the gentle flavors of this cake. Anyone tried this? I’m sure it would taste great too, although I’ve never tried it. I hope you enjoy the cake. I made this cake twice, and vanilla souffle part came out perfectly well. However, I have to challenge you on a dough part. Sorry, but the real Birds milk (aka the one made in Moscow) is cooked a bit differently. you beat sugar and butter first, then add eggs and flour. Draw 2 circles on a wax paper. Divide batter. Make it even with spatula. Bake on 425F for 7 min. Cut the edges a bit, so it would fit into your springform. It’s not even necessary to moisten it with a liquer, as the two layers come out perfectly soft. And it’s so much easier to make, than trying to cut a layer into two. Besides both layers come out very evenly in terms of thickness. Thank you for sharing the recipe, Victoria. I would love to try it and will do so in the future. I never claimed that my recipe was the “original” one, which it definitely isn’t. 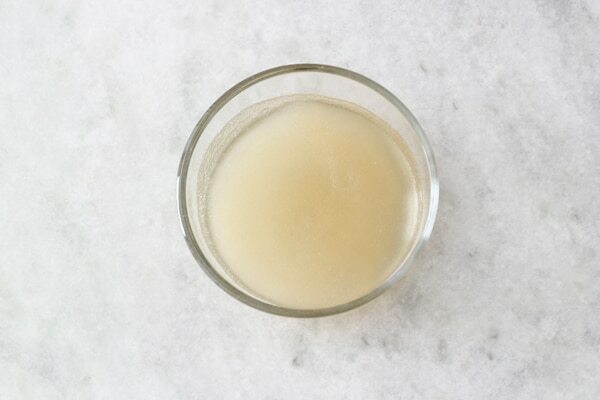 Instead of raw egg whites, you could try using whipped bean/chickpea broth (aka “aquafaba”). This was just discovered in early 2015, and works just like egg whites for all kinds of preparations. I can vouch for some of them myself, having used it in several ways over the past few weeks. It has none of the disadvantages of raw egg whites for digestion (and the sweetened whip itself is a tasty and perfectly safe treat in itself!). Bonus: cheaper than eggs themselves! How far in advance can I make this cake? Will it be good for 2 days in the fridge or is that too long? I usually make cakes 1 day in advance, but 2 days in advance should be good too, Ruslana. Hi Olga, what Can I use instead of chocolate liquor? You can just omit it, or use a bit of vanilla extract for flavor. I’m not sure what happened but my souffle did not come out good. It looked kind of smashed cottage cheese. I was so disappointed in myself. I don’t know what I did wrong. I’m sorry to hear that; I’m not sure what went wrong without more details, but I wish I could help you figure out how to fix the possible issues. Hi Olga. Does that cake freeze well? I do not recommend it, Anna.